Salinas started the race day from the No. 1 qualifier position. He powered his Scrappers Racing dragster to a victorious 3.801-second, 330.39-mph pass when he outran Brittany Force, Clay Millican and Doug Kalitta. Force finished as the Top Fuel runner-up. "It means a lot," Salinas said. "I have this program that I put in my head, and I believed it would work. Alan Johnson (tuner) has been five years in the making. Didn't say much, just let everything fall where it's going to fall. We build something and now we can go racing. "The important thing, for me, is that I have four daughters coming into the sport. I set the bar for my family all the time, and now we have a good bar for them to reach and meet from the (Pro Stock) motorcycle, to the A-Fuel, to our Pro Mod coming, to everything we're going to do. It's going to be a great thing." 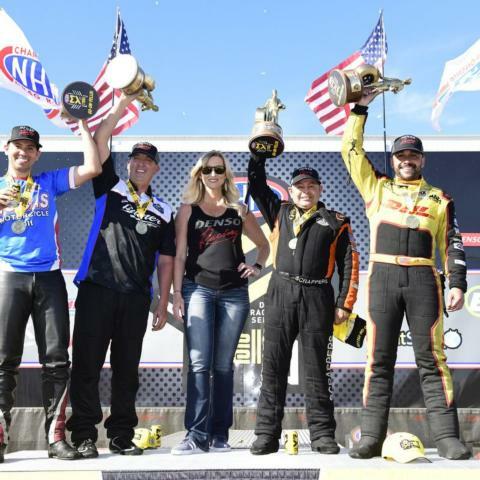 The reigning Funny Car World Champion Todd drove his DHL Toyota Camry to the Funny Car title on Sunday with his 3.970 pass at 319.07. He has won three consecutive events at the Las Vegas track. "It's all Kalitta Motorsports," Todd said. "It seems like ever since I've come on board with this team, we've always run well here. This whole team, all four cars, have a really good handle on this place, especially Todd Smith and Jon (Oberhofer, crew chiefs). It seems like the more we come here, the better grip they get ahold of this place." In Pro Stock, Butner picked up his third win of the 2019 season with his Jim Butner's Auto Chevy Camaro team with his 6.677 pass at 206.67. The 2017 world champ got the final win light of the day with his triple holeshot victory over the quad of Matt Hartford, Jason Line and Greg Anderson. Hartford was second to the stripe and finished as the runner-up. Butner's Sunday win is his first four-wide win and his second win at the Strip at LVMS. "I learned that you can't be a lazy winner," Butner stated. "The win light is off now, and it's time for the next race. We've got to work hard, but I'm with the best team. "I'm in the final with Greg and Jason, we're like three brothers. It's just great to get that with Ken (Black, team owner). It worked out to be a good day and just very blessed and can't complain." Arana Jr. picked up the win on his Lucas Oil EBR among a quadrant of champions consisting of reigning champ Matt Smith, five-time champion Andrew Hines and four-time champion Eddie Krawiec. Smith came in second, while Hines broke on the starting line and Krawiec fouled out with his red-light start. Arana Jr. cruised to a 6.907 at 195.97 to pick up his second win at the Strip at LVMS. "That Lucas Oil motorcycle, she's bad to the bone," Arana Jr. said. "That's just a testament to my team and the consistency. We weren't the fastest, but we were consistent all weekend. "I worked on my lights, and they got better and better and I stepped it up when I needed to step it up in the final because the final was stacked. I love going up against those guys. It makes me put out my best. It's just something about racing those guys that you just dig deep and really go for it." Mike Salinas; 2. Brittany Force; 3. Doug Kalitta; 4. Clay Millican; 5. Steve Torrence; 6. Billy Torrence; 7. Terry Totten; 8. Richie Crampton; 9. Terry McMillen; 10. Scott Palmer; 11. Antron Brown; 12. Leah Pritchett; 13. Cameron Ferre; 14. Steven Chrisman; 15. Austin Prock. Clay Millican, 3.777, 328.14 and Terry Totten, 4.053, 301.54 def. 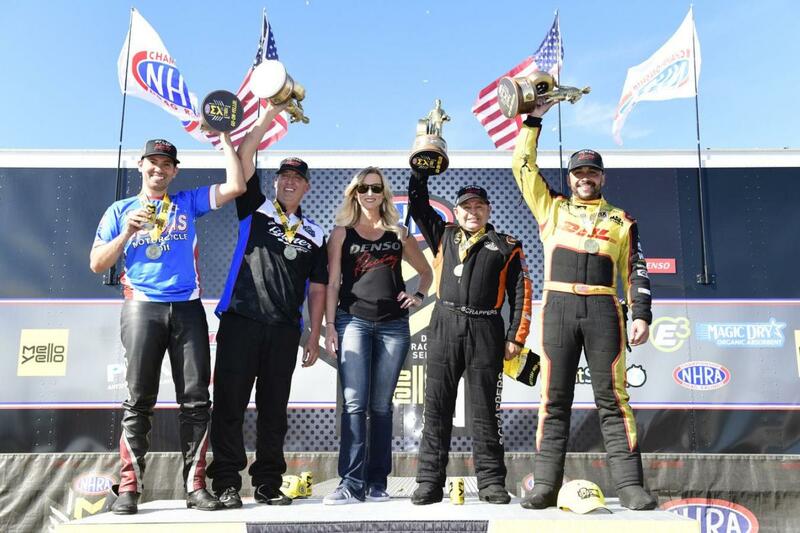 Leah Pritchett, 6.768, 114.02 and Austin Prock, 20.242, 40.84; Brittany Force, 3.731, 320.74 and Richie Crampton, 3.769, 316.23 def. Scott Palmer, 3.798, 326.24 and Cameron Ferre, 3.998, 299.00; Steve Torrence, 3.729, 324.67 and Doug Kalitta, 3.780, 320.51 def. Terry McMillen, 3.770, 323.81 and Steven Chrisman, 6.102, 86.90; Mike Salinas, 3.747, 328.86 and Billy Torrence, 3.966, 271.95 def. Antron Brown, 4.072, 237.75. Salinas, 3.769, 325.45 and Millican, 3.793, 316.45 def. B. Torrence, 3.817, 319.22 and Totten, 4.157, 247.70; Force, 3.769, 318.99 and Kalitta, 3.790, 320.81 def. S. Torrence, 3.783,323.89 and Crampton, 4.903, 147.68. Mike Salinas, 3.801 seconds, 330.39 mph def. Brittany Force, 3.810 seconds, 321.42 mph and Doug Kalitta, 4.333 seconds, 193.74 mph and Clay Millican, 4.350 seconds, 264.23 mph. J.R. Todd; 2. Tommy Johnson Jr.; 3. Jack Beckman; 4. Tim Wilkerson; 5. Matt Hagan; 6. John Force; 7. Ron Capps; 8. Jeff Diehl; 9. Cruz Pedregon; 10. Gary Densham; 11. Bob Tasca III; 12. Shawn Langdon; 13. Phil Burkart; 14. Terry Haddock; 15. Robert Hight; 16. Jim Campbell. Tim Wilkerson, Ford Mustang, 3.891, 325.69 and Jeff Diehl, Toyota Camry, 4.223, 264.23 def. Shawn Langdon, Camry, 4.538, 173.47 and Robert Hight, Chevy Camaro, 4.524, 186.30; Tommy Johnson Jr., Dodge Charger, 4.234, 229.27 and Ron Capps, Charger, 4.280, 265.06 def. Bob Tasca III, Mustang, 4.332, 268.65 and Terry Haddock, Mustang, 4.302, 289.88; John Force, Camaro, 3.916, 329.67 and Jack Beckman, Charger, 3.958, 322.88 def. Cruz Pedregon, Charger, 3.981, 322.19 and Phil Burkart, Charger, 4.172, 263.56; Matt Hagan, Charger, 4.073, 288.03 and J.R. Todd, Camry, 4.349, 210.31 def. Gary Densham, Mustang, 4.330, 223.62 and Jim Campbell, Charger, 4.832, 168.14. Wilkerson, 3.996, 312.21 and Todd, 4.030, 314.24 def. Hagan, 4.017, 303.57 and Diehl, 5.727, 122.73; Johnson Jr., 3.994, 315.93 and Beckman, 4.010, 318.32 def. Force, 4.025, 321.81 and Capps, 4.037, 315.05. J.R. Todd, Toyota Camry, 3.970, 319.07 def. Tommy Johnson Jr., Dodge Charger, 3.975, 313.29 and Jack Beckman, Charger, 4.370, 213.16 and Tim Wilkerson, Ford Mustang, 4.401, 205.35. Matt Hartford, Chevy Camaro, 6.658, 206.73 and Chris McGaha, Camaro, 6.687, 206.04 def. Shane Tucker, Camaro, 6.733, 203.06 and Rodger Brogdon, Camaro, 10.559, 86.44; Alex Laughlin, Camaro, 6.661, 206.04 and Greg Anderson, Camaro, 6.692, 207.78 def. Steve Graham, Camaro, 6.697, 206.51 and Joey Grose, Camaro, 6.712, 205.16; Erica Enders, Camaro, 6.651, 205.72 and Jason Line, Camaro, 6.672, 206.83 def. Alan Prusiensky, Dodge Dart, 6.721, 203.86 and Jeg Coughlin, Camaro, 6.849, 171.25; Bo Butner, Camaro, 6.639, 206.92 and Jeff Isbell, Ford Mustang, 6.851, 202.85 def. Fernando Cuadra, Camaro, broke and Deric Kramer, Camaro, broke. Line, 6.680, 207.02 and Anderson, 6.689, 207.88 def. Laughlin, 6.694, 205.88 and Enders, 7.071, 204.05; Butner, 6.665, 207.02 and Hartford, 6.674, 206.48 def. McGaha, 6.672, 206.64 and Isbell, 6.801, 203.77. Bo Butner, Chevy Camaro, 6.677, 206.67 def. Matt Hartford, Camaro, 6.667, 206.51 and Jason Line, Camaro, 6.674, 206.99 and Greg Anderson, Camaro, 6.655, 207.94. Hector Arana Jr; 2. Matt Smith; 3. Eddie Krawiec; 4. Andrew Hines; 5. Karen Stoffer; 6. Hector Arana; 7. Jerry Savoie; 8. Angie Smith; 9. Angelle Sampey; 10. Steve Johnson; 11. Joey Gladstone; 12. Cory Reed; 13. Ryan Oehler; 14. Kelly Clontz; 15. Jim Underdahl; 16. Freddie Camarena. Karen Stoffer, Suzuki TL, 6.942, 193.21 and Andrew Hines, Harley Street Rod, 6.901, 195.51 def. Joey Gladstone, EBR, 6.999, 191.38 and Jim Underdahl, Suzuki GS, 7.064, 192.22; Eddie Krawiec, Street Rod, 6.903, 195.48 and Jerry Savoie, TL, 6.944, 191.81 def. Cory Reed, EBR, 7.127, 191.27 and Freddie Camarena, Suzuki GSXR, 7.355, 180.02; Hector Arana, EBR, 6.917, 196.39 and Hector Arana Jr, EBR, 6.891, 195.62 def. Steve Johnson, TL, 6.978, 189.98 and Kelly Clontz, TL, 7.009, 191.95; Matt Smith, EBR, 6.886, 197.31 and Angie Smith, EBR, 7.012, 193.18 def. Angelle Sampey, Street Rod, 6.970, 193.65 and Ryan Oehler, Buell, 6.980, 195.39. Krawiec, 6.924, 194.46 and Arana Jr, 6.915, 195.62 def. Arana, 6.995, 195.76 and Savoie, 6.985, 192.38; Hines, 6.902, 195.19 and M. Smith, 6.919, 196.22 def. Stoffer, 6.942, 192.80 and A. Smith, 6.995, 194.55. Hector Arana Jr, EBR, 6.907, 195.79 def. Matt Smith, EBR, 6.903, 197.02 and Eddie Krawiec, Harley-Davidson, foul and Andrew Hines, Harley-Davidson, broke. Doug Kalitta, 319; 2. Mike Salinas, 286; 3. Steve Torrence, 256; 4. Leah Pritchett, 244; 5. Richie Crampton, 233; 6. (tie) Clay Millican, 231; Billy Torrence, 231; 8. Brittany Force, 224; Terry McMillen, 198; 10. Antron Brown, 184. Robert Hight, 363; 2. Jack Beckman, 297; 3. Tommy Johnson Jr., 283; 4. J.R. Todd, 280; 5. Matt Hagan, 271; 6. John Force, 258; 7. Tim Wilkerson, 246; 8. Ron Capps, 205; 9. Bob Tasca III, 198; 10. Cruz Pedregon, 179. Bo Butner, 425; 2. Alex Laughlin, 285; 3. Matt Hartford, 284; 4. Jason Line, 261; 5. Erica Enders, 239; 6. Jeg Coughlin, 225; 7. Rodger Brogdon, 220; 8. Greg Anderson, 208; 9. Deric Kramer, 199; 10. Chris McGaha, 189. Andrew Hines, 201; 2. Hector Arana Jr, 198; 3. Eddie Krawiec, 188; 4. Matt Smith, 170; 5. Jerry Savoie, 105; 6. Joey Gladstone, 103; 7. Karen Stoffer, 88; 8. Ryan Oehler, 87; 9. (tie) Hector Arana, 85; Jim Underdahl, 85. Top Alcohol Dragster - Jackie Fricke, 5.319, 267.32 def. Joey Severance, 5.286, 273.94. Top Alcohol Funny Car - Chris Marshall, Chevy Camaro, 5.709, 263.05 def. Doug Gordon, Camaro, 6.155, 261.93. Competition Eliminator - Doug Lambeck, Pontiac Sunfire, 8.507, 146.05 def. Josh Lee, Bantam roadster, 9.371, 110.46. Super Stock - Anthony Bertozzi, Pontiac Grand Am, 9.214, 142.45 def. Don Thomas, Grand Am, 10.602, 123.86. Stock Eliminator - Justin Jerome, Plymouth Duster, 10.818, 120.11 def. Ryan Mangus, Chevy Camaro, 10.858, 120.01. Super Comp - Marko Perivolaris, Dragster, 9.038, 181.01 def. Luke Bogacki, Dragster, 9.026, 175.73. Super Gas - Tanner Hiatt, Chevy Corvette, 10.056, 147.58 def. Steve Williams, Corvette, 10.067, 160.73. Top Dragster - Andy Spiegel, Dragster, 6.736, 192.80 def. Robert Tehle, Dragster, 6.184, 227.08. Top Sportsman - Doug Crumlich, Chevy Corvette, 7.031, 194.49 def. Jeff Gillette, Pontiac GTO, 6.963, 198.03.